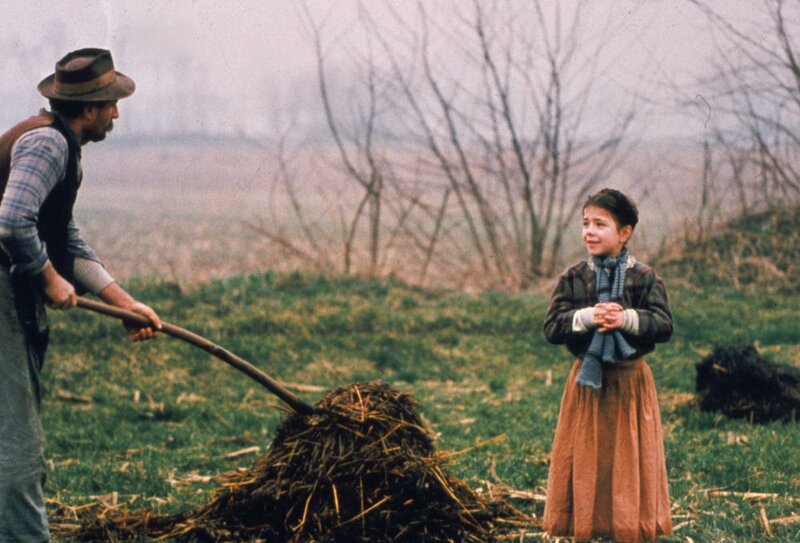 Written, directed, shot, and edited by Ermanno Olmi, L’Albero degli zoccoli (The Tree of Wooden Clogs) is the story of four peasant farm families working for a landlord in the late 19th Century as they deal with many trials and tribulations in the course of a year. The film is an exploration of life of farmers and workers living in the countryside as they deal with changing times and other events around them with many of the people in the film are portrayed by non-professional actors. L’Albero degli zoccoli is a ravishing and somber film from Ermanno Olmi. Set in 1898 at the Bergamo region of Northern Italy, the film follows the year of the lives of four peasant farm families who work on a land for a landlord who has no care for their lives other than the money that is made from the harvest where he keeps 2/3 of the profits despite doing little to provide for his peasant farmers. It’s a film that has a multi-layered story that follows the lives of these four different families as the opening scene involves a man who is about to have a third child while struggles with the fact that his eldest son is given the opportunity to attend school nearby as the local priest suggests that the boy should get that chance for an education. Other storylines involve an old widow raising six children while her father is eager to plant tomatoes as he has a secret method while there’s a story of a young couple that are courting each other. Ermanno Olmi’s screenplay would follow the four families and at one point would focus on one family or all of them. All the families would endure hardships such as changing seasons, births, deaths, and all sorts of things yet they continue to work and live their lives during the course of the year. Even as they all come together for a celebration or a gathering that include a moment where they go to a local fair to have some fun. Yet, there is this undercurrent of change that is emerging where a farmer is trying to pick up a gold coin while a man is making a speech about the ideas of communism. For these farmers, they don’t know much about the outside world nor do they care to as they much prefer to work as well as pray for each other as they would often attend church on Sundays. Still, there is this element of change that is happening that would become possible to ignore as it play into this dark emergence of modernism. Olmi’s direction is understated in its approach to capturing late 19th Century life in Northern Italy as it is shot on location in Bergamo where all of the dialogue is spoken in the Bergamasque dialect. Shot in the 1:37:1 full-frame aspect ratio, Olmi would use the framing device to capture the simplicity of the landscape while the film doesn’t feature a lot of close-ups in favor of capturing the group of peasant farmers in medium and wide shots. Even as he maintains a realism in not just using non-professional actors but also in recreating a lifestyle and ideal that was much simpler before the emergence of industry and political ideals. Among these elements of realism is the fact there’s a couple of scenes of animals being slaughtered for food but it’s presented in a humane approach while there is also this tender scene in which the widow copes with her ailing cow as she prays for a miracle in the hope that the cow would recover. It’s these small moments in the film that include a scene of the father whose son is attending school as he would cut down a tree to create new clogs for his son. Also serving as the film’s cinematographer and editor, much of Olmi’s approach to the visuals is straightforward as he aims for a naturalistic look in the photography in the way mornings are presented as well as a rainy day. For the interior scenes including a scene inside a room where the grandfather tells many of the other farmers and their families a story is presented in a natural lighting while the editing also play into some of the humor and drama. Notably in the latter as it would occur in a key sequence late in the film where the young couple arrive at the city of Milan where they notice something drastic is happening as it play into this emergence of chaos that is to come into the next century as well as the uncertainty if they can survive the modern world. The film’s ending isn’t just about the power of landlords and their indifference towards those who work for them but also the idea that prayer and sympathy can’t save everyone. Overall, Olmi crafts a touching and rapturous film about the lives of four peasant family farmers in Northern Italy before the emergence of the 20th Century. Production designer Enrico Tovaglieri and set decorator Franco Gambarana do brilliant work with the look of the farm in its decayed look as well as the look of the convent-orphanage the young couple would stay in Milan. Costume designer Francesca Zucchelli does fantastic work with the costumes as it does play into the realistic and ordinary look of the farmers. The sound work of Amedeo Casati does terrific work with the sound as it play into the natural elements of the location as well as the way objects and animals sound on location. Much of the film’s music feature compositions from Johann Sebastian Bach that is performed by Fernando Germani is majestic for the way it play into the world that the characters live in as well as this air of faith that looms over them as it play into these characters seeking salvation in a world that is ever-changing. The film’s spectacular cast filled with non-professional actors as it include Marlo Brignoli as the landlord, Emilio Pedroni as the foreman, Vittorio Capelli as the merchant seller Friki, Francesca Bassurini as a relative of the young bride Maddalena in Sister Maria, and Lina Ricci as a woman who believes in signs. The performances of Luigi Ornagghi as Batisti, Francesca Moriggi as his wife Batistina, Omar Brignoli as their son Minek are superb as is the duo of Lucia Pezzoli and Franco Pilenga in their respective roles as the young bride and groom in Maddalena and Stefano. The performance of Teresa Brescianini as the widow Runk and Giuseppe Brignoli as her father Anselmo are excellent while Battista Trevaini is terrific as Finard who finds a gold coin only for things to go wrong. L’Albero degli zoccoli is a tremendous film from Ermanno Olmi. Featuring a great cast, gorgeous visuals, a haunting music score, and a somber yet devastating story about the simple life of four peasant farming families dealing with the ever-changing world outside of their quaint community. It’s a film that explore a moment in time and a lifestyle that was prosperous as well as being communal despite the emergence of modernism that would change everything. In the end, L’Albero degli zoccoli is a phenomenal film from Ermanno Olmi.